Thank you to everyone who took part in our ‘nominate your friends to join TES’ competition. Thank you to everyone who took part in our 'nominate your friends to join TES' competition. 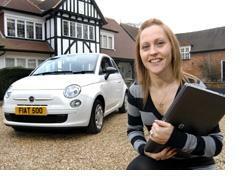 The lucky winner of a brand new Fiat 500 is Katy Reed, who works at Davenies School in Buckinghamshire, UK. Why not share TES with your friends? For every friend that you recommend who joins, you will get one ticket in our weekly raffle to win £500 each! There is also £1,000 each for the 5 people who have recommended the most friends who join TES by the closing date of Monday, 2nd of April. Find out more. What does winning the car mean to you? This means the world to me, and will make my life a lot easier. My last car broke down in October 2010, 6 weeks before my wedding, and with all the wedding bills at the time we couldn't afford to have it fixed. I have been getting the bus ever since. This means the end of waiting in the cold and dark at the bus stop! Where are you looking forward to driving to? My sister's husband is in the RAF and they have just been reposted, so I can't wait to drive down to their new house and see my niece and nephew. Why did you recommend TES to your colleagues? A lot of my colleagues were already signed up, so it was targeting the few that weren't to let them know that there is something on the TES website for everyone, whether sharing resources, joining forums or just looking at the online magazine. What do you like best about TES? As HR Administrator I have recently signed the School up to TES HireWire and have found it a fantastic way to recruit new staff. A huge 'Thank You' to my colleagues for signing up to TES and helping me win this car, always willing to go that extra mile. They are all so happy for me, and I hope that they find the TES a useful resource. 'Thank You' also to my husband for chauffeuring me around for the last 16 months, I owe a lot of people a lot of lifts! Finally, 'Thank You' to the TES for literally changing my life for the better.